This is an innovative interdisciplinary book about objects and people within museums and galleries. It addresses fundamental issues of human sensory, emotional and aesthetic experience of objects. The chapters explore ways and contexts in which things and people mutually interact, and raise questions about how objects carry meaning and feeling, the distinctions between objects and persons, particular qualities of the museum as context for person-object engagements, and the active and embodied role of the museum visitor. 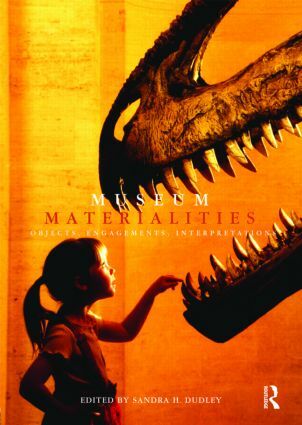 Museum Materialities is divided into three sections – Objects, Engagements and Interpretations – and includes a foreword by Susan Pearce and an afterword by Howard Morphy. It examines materiality and other perceptual and ontological qualities of objects themselves; embodied sensory and cognitive engagements – both personal and across a wider audience spread – with particular objects or object types in a museum or gallery setting; notions of aesthetics, affect and wellbeing in museum contexts; and creative and innovative artistic and museum practices that seek to illuminate or critique museum objects and interpretations. Phenomenological and other approaches to embodied experience in an emphatically material world are current in a number of academic areas, most particularly strands of material culture studies within anthropology and cognate disciplines. Thus far, however, there has been no concerted application of this kind of approach to museum collections and interactions with them by museum visitors, curators, artists and researchers. Bringing together essays by scholars and practitioners from a wide disciplinary and international base, Museum Materialities seeks to make just such a contribution. In so doing it makes a valuable and original addition to the literature of both material culture studies and museum studies.